So I had this idea bothering me since I first saw the Sakurabito ending. 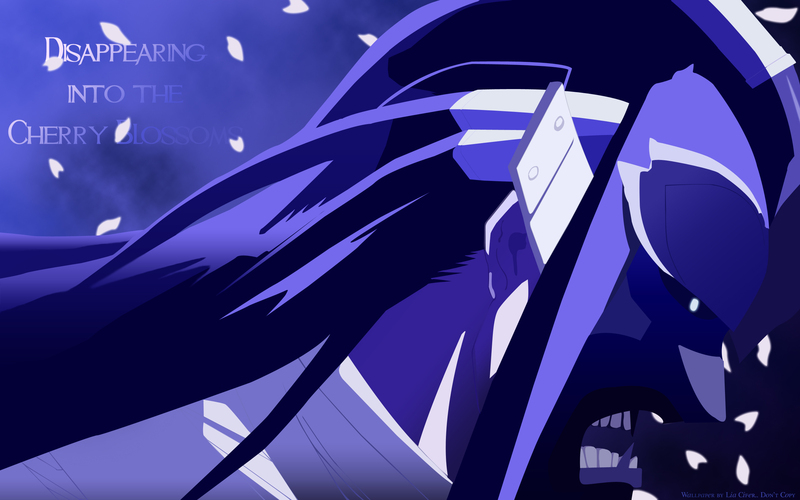 That picture of Byakuya wearing Senbonzakura's mask sent chills down my spine, I SO loved it. The title comes from anime episode 231 "Byakuya, Disappearing into the Cherry Blossoms" where Byakuya disappears after protecting Renji and Rukia from Senbonzakura, in the beginning of the Zanpakuto arc. I played a bit with gradients, I particularly liked how it came out on the mask and scarf. The petals I was hoping of vectoring them from an already existing Byakuya pic, but ended up drawing them myself, 'coz I couldn't find any pic with the petals I liked, I hope they don't look too terrible. I finally fixed the hair, for as much as I could figure, played a bit more with gradients, blurring and smudging. Added brush texture to the BG, loved how it looked. (texture from [link] ). Added the text (font: Mulan). I used the gradient to give the effect of "disappearing", I kinda liked it. is till think your shapes could be fixed a little more to flow better but i generally like the colors and the positioning. great wallpapper! thanks for sharing!